The Israeli Authorities, including the City Council of occupied Jerusalem, have decided to demolish an entire Palestinian neighborhood in Kafr ‘Aqab, northeast of Jerusalem, under the pretext of being built without a permit. The neighborhood is close to Qalandia terminal, and became isolated from the rest of occupied East Jerusalem after Israel built the illegal Annexation Wall, and now intends to demolish the neighborhood, due to “its proximity to the wall, and for being built without a permit from the City Council,” although Israel’s wall isolated Kafr ‘Aqab from Jerusalem. 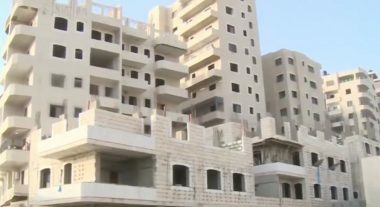 The demolition plan targets six residential buildings, each consisting of six floors, of around 140 flats, in addition to a mosque, and is slated to be carried out in one month. Many families already inhabited apartments. Israel intends to destroy the buildings by using controlled explosions to turn them into rubble, while the Palestinians insist on remaining in their homes, especially since they have no other alternatives. There are approximately 50.000 Palestinians living in Kafr Aqab, all are bearers of Israeli-issued Jerusalem ID cards, and are deprived basic rights, such as public services and maintained roads.